search dog is nine years old, her handler monitors the canine's comfort a lot closer. the black Search Dog's Raven memento frame hanging in their lobby. 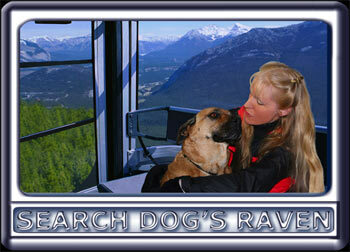 and Marcia DeMasson who were instrumental in Search Dog's Raven filming at the Banff Gondola. Ebbey the canine actor, was found starving in a garbage dump just months before filming began. at the Banff Gondola, and some were photographed against a green screen and composited afterwards.